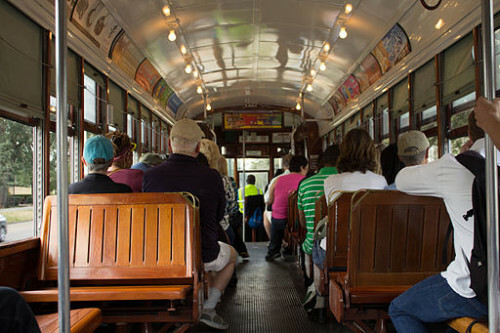 Last week, three men with disabilities filed a suit against the city of New Orleans, its Regional Transit Authority, and private company Transdev for providing insufficient access to the city’s historic St. Charles streetcar. Leveraging the Americans with Disabilities Act (ADA) and the Rehabilitation Act, Mitchell Miraglia, Francis Falls, and Thad Tatum claim the streetcar, both a top attraction and a critical vein in the city’s transportation system, is completely cut off to individuals with disabilities—both because the streetcars themselves aren’t accessible, and because the curbs along St. Charles Avenue don’t have curb cuts to allow wheelchairs to navigate the blocks with ease. New Orleans has been subject to several similar lawsuits over the past few years. Former mayoral candidate Jonah Bascle led single-issue campaigns for mayor and city councilor focused on the inaccessibility of the city’s transportation infrastructure. New Orleans buses are the most significant and frequently accessed transportation infrastructure in the city, but only 5.7 percent of bus stops are fully compliant with the ADA. The Americans with Disabilities Act, landmark legislation passed in 1990, prohibits discrimination against people with disabilities in employment, transportation, public accommodation, communications, and governmental activities. Over the past 25 years, there has been debate over where the law can be applied and the institutions that do not have to comply. Religious institutions, for example, don’t have to comply with ADA protocols, though many have argued they have a moral obligation to do so. Last year, companies like Uber and Lyft came under fire for not enforcing disability access in their cars. They centered their defenses on the same argument they use to limit employee benefits to their drivers, claiming that they are, in essence, a technology company and not a transportation company. Therefore, while they are responsible for making their app and web interface accessible for the visually and hearing impaired, they are not responsible for the accessibility infrastructure in their driver’s cars. “Obviously, we would like every streetcar on every street to be compliant, but we realize that may not be tenable,” said Andrew Bizer, the attorney leading this latest suit. Still, Bizer and other accessibility advocates point to an overall underinvestment in accessibility from the RTA and fear that this is simply another loophole for avoiding changes to broader transportation systems. A new Ruderman Family Foundation white paper finds that while elite Ivy League institutions expect high achievement from their students, they receive failing scores in mental health care.